Our strengths lie in our brand, our store network and human assets that we have developed over many years. We consider the BOOKOFF Group’s mission to “Be a source of enjoyable and enriching lives for as many people as possible.” As a leading company engaged in the reuse of a variety of goods, primarily books, we add enjoyment and fulfillment to customers’ lives, and each individual employee seeks to grow as we carry out our business activities, to achieve our corporate philosophy by maintaining sustainable growth. 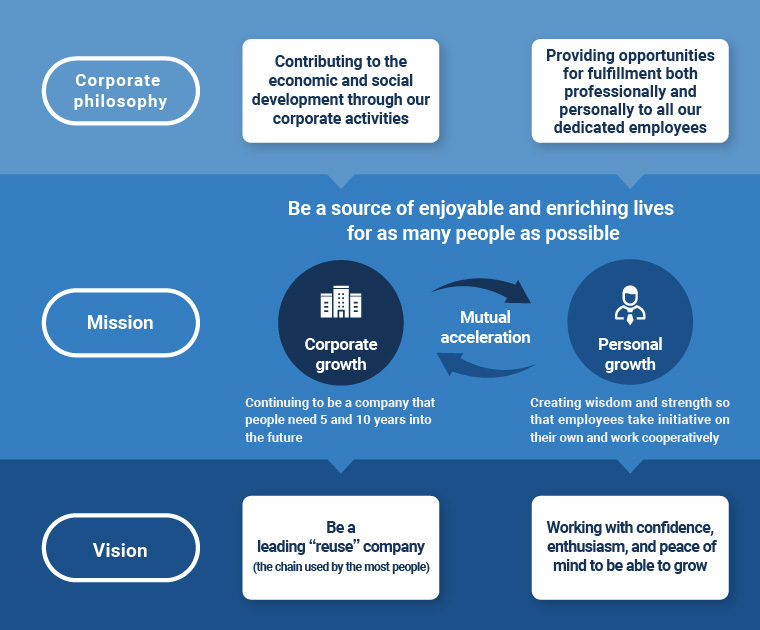 The BOOKOFF Group has adopted “six endeavors” for achieving the corporate philosophy and promoting the growth of the Group and individual employees. 1Every day strive to work harder than anybody else. 2Be humble and never arrogant. 6Don’t dwell upon the past.